Another Give-Away from Vegan MoFo! And we have our 2 winners!! Well done to both of you. Please email VeganMoFoBlog@gmail.com with your name and address. See you soon for some more AWESOME MoFo give-aways. A massive THANK YOU to the awesome people over at The Book Publishing Company and the authors for yet another fab give-away. Today’s give-away is 2 copies of Vegan Bodybuilding by Robert Cheeke. Renowned for his passion, dedication and determination, Robert Cheeke has inspired athletes, trainers and anyone interested in a strong, healthy body. He has been at the forefront in ushering in a different way to fuel and nourish bodybuilders in an industry riddled with animal-derived body-enhancing supplements. 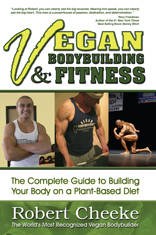 Being one of the most prominent figures in vegan bodybuilding, his advice on diet, training, and other facets of the lifestyle make this book a fantastic resource for beginners and experienced athletes alike. To enter into the contest leave a comment telling us what your favoutite Thanksgiving food is and we’ll pick two winners at random, tomorrow at around 4pm PST. Please note that this is limited to folks in the domestic U.S. Please include the link to your blog OR your email address when you make a comment. VeganMoFo Roundup: Hey there, good lookin'! I love Thanksgiving Tofurky with homemade mashed potatoes, and pumpkin cranberry walnut bread. my favorite thanksgiving food is mashed potatoes topped with home made cranberry relish and gravy! sweet-salty-savory in each bite! Mashed potatoes with peas mixed in! I have a sweet tooth, so my favorite Thanksgiving dish is the pumpkin pie! My favorite is a toss up between pies, but I’m not a fan of the crust so perhaps it is a mixture of apple pumpkin and pecan pie centers in one dish. Mashed potatoes with a boatload of gravy. I may as well serve the gravy bowl and just put a little spoon of mash in it! I love sweetpotatoes! Nom Nom! Roasted brussels sprouts. Except I eat them year round. Favorite exclusive to thanksgiving dish is stuffing. I only eat it on T-Day. I SO want to read that book! I’d have to say, Tofurkey with mashed potatoes, corn and gravy. White Bean-filled Phyllo Purse over Soft Garlic Polenta with Porcini-Zinfandel Sauce, Broccoli Rabe, and Grilled Pear. I can’t add anything else to that title that would describe it any better. pumpkin roll with vegan cream cheese!!!!! Fasting in acknowledgment of the numerous atrocities and genocide committed against the indigenous people of the Americas. Sweet Potato Pie with a Pecan Crumble…awesome! Cornbread dressing/stuffing with cranberry sauce! This is cool; I’ve been researching vegan nutrition a lot since I workout heavily now. Check me out @ http://vegnsoul.wordpress.com. I’m looking forward to Tofurky, stuffing and gravy sandwiches after the big day! Pumpkin pie, sweet potato pie, chocolate mousse pie. Pie! Pie! Pie! I love a good butternut squash souffle! I’m really excited for what I’ll eat this year: whole wheat pizza made with cranberry sauce, daiya, “turkey,” apples, thyme and rosemary. Ohhhh yeah. Cranberry sauce made with port, pears, star anise, cinnamon and vanilla. Way awesome, some legitimate factors! I recognize you creating this informative article obtainable, the remainder of the internet site can also be higher good quality. Possess a entertaining. Following all, what a terrific internet site and educational posts, I’ll upload inbound website link – bookmark this website website? Regards, Reader.